The first Museo Mundial Project installation at the Castle Museum of the Budapest History Museum highlights water consumption habits today. The installation is located in two different places in the museum. 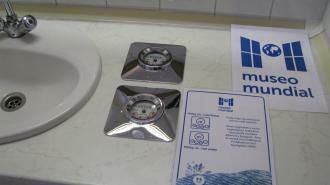 Firstly, water consumption meters with the question “How much water do you think you use when you wash your hands or use the toilet?” have been installed in the restrooms on the first floor. Secondly, the main part of the installation is located in the “Bathing Culture – Rudas Bath” section within the exhibition “Budapest Light and Shadow - a 1000 Years of a Capital”. In the form of a transparent table, filled with paper balls symbolizing water drops, and several tin buckets, the installation raises questions among those visitors living in Europe or Northern America where access to safe drinking water flowing straight from the taps is taken for granted. So, to what extent are we aware of the true value of water across the world? Do we appreciate this natural resource as much as we should? The visitor can check how much water he/she uses when washing his/her hands or using the toilet. The toilets are located on the same floor as the permanent exhibition: “Budapest Light and Shadow – the 1000 Years of a Capital”. A map guides the visitor towards the second part of the tool, which is located within and forms part of the “Bathing Culture – Rudas Bath” exhibition. The installation itself is placed in front of showcases in the form of a beach cabin, which exhibit the history of swimsuits, and next to posters from different eras about bathing culture. It includes five tin buckets of various sizes (5l, 2l, 1l and 3 dl). The two-litre bucket is filled with paper pearls that imitate water pouring out of the bucket. In this way, the different quantities can be demonstrated. Next to the table, a upside-down tin bucket is covered with a cushion and offers a comfortable place for the visitor to sit while reading related information materials. The installation is linked to a room introducing the history of bathing culture in Budapest from Turkish baths to metropolitan spas, which were based around Hungary’s springs. The information materials link visitors to the present and the aim of preserving the tradition of Turkish bathing for as long as possible. 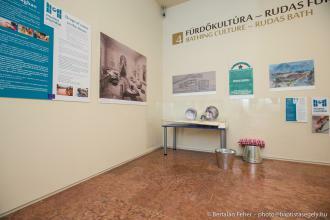 Water was already a prominent theme within the Budapest History Museum, since one of the recently refurbished permanent exhibitions on the history of Budapest displays the tradition of water cures in Turkish baths in Budapest. Basically, these exhibits cover the whole topic in one room, by displaying how it has evolved over various centuries. This explains why fragments from Turkish bath tubs are found next to swimsuits from the 20th century in this exhibition. Moreover, there is a poster that declares that ‘in the past only the rich had the opportunity to go to the baths, but from now on the public baths are open to everyone’. Therefore, the availability of clean water in different parts of the world fitted in well with this exhibition. In addition, we wanted to surprise visitors by engaging with them in a place where they would least expect it. This is why we chose the restrooms to install water meters on both the taps and the toilet cisterns. We needed to find sites within the permanent exhibitions to install the tools and the room we chose proved adequate for this purpose. We wanted to symbolize water drops through the use of little balls filling up the buckets. However, we could not use glass balls as they would have shattered on the marble floor of the exhibition. They could not be too small either, so as to avoid them being swallowed by children standing next to the table. We considered Plexiglas because it appeared to be the most translucent material available and, therefore, suitable for symbolizing water. 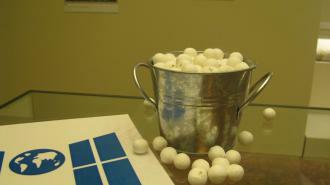 However, eventually, we decided on paper balls because they were the right size and were affordable. To create this installation, we needed not only graphic designers but also an interior architect or installation designer to develop the Plexiglas table. If there is a partner available with whom you are used to working, or perhaps even the one who created the permanent exhibition, that would be the easiest solution. The design process is not cheap and prices can vary widely. Besides, the cheapest option is not necessarily the best option. Further aspects to consider are the materials and assembling the installation. In our case, we could not find a water meter that displayed water consumption clearly enough, so we had to choose carefully explanatory diagrams instead of it. One of the main aims determining the choice of content was that it should grab the visitor’s attention. This led to content being placed in the restrooms. In the spa culture section, the main determining factor in the choice of content was the need to explain to visitors why they should pay attention to this issue and how it works in other places and countries. So, our goal was to answer these kinds of questions that visitors were likely to raise. According to feedback, visitors particularly welcome the advice given in the installation on how water consumption can be reduced. When we want to explain more serious content through short texts, it is worth asking outsiders to check the message and give their opinions on it. A simple but clear message will have the greatest impact. In a museum, it may be that an installation like this split between two locations cannot be completed on the one day of the week when the museum is closed. Therefore, it is advisable to schedule the installation process in a way that minimizes any inconvenience and confusion that might be caused to visitors by the presence of a semi-finished item for a few days. The installation and its surrounding area should be constantly checked because people like to write or draw on the walls. The surprise element provided by the question in the museum’s toilet grabs the attention of visitors. The choice of water as a topic complemented the subject of bathing culture in the permanent exhibition. The opportunity to touch and play with the buckets and pearls helps raise awareness among visitors. It is not easy for some visitors to imagine that the paper balls are water drops. This type of water meter does not display attention-grabbing results for water consumed during hand washing. Visitors appreciate the advice on water saving. The little balls representing water drops are difficult to interpret for many people.